We’ve been working with Accenture for almost 6 years. 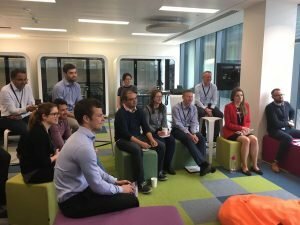 Following the success of a yoga and meditation ‘ice-breaker’ session at a conference at London’s Barbican, more recently, we’ve been delivering monthly after-work workshops as part of their annual wellbeing strategy. Mindfulness meditation, chair yoga and ‘Resilience Toolkit for the Workplace’ have been some of the most popular workshops.